I'll take a side of local history with my meal! It's always fun to learn about the history of a place by getting a side of history with your burger or omelet. Spike's traces its beginnings to the end of Prohibition, opening in 1933. 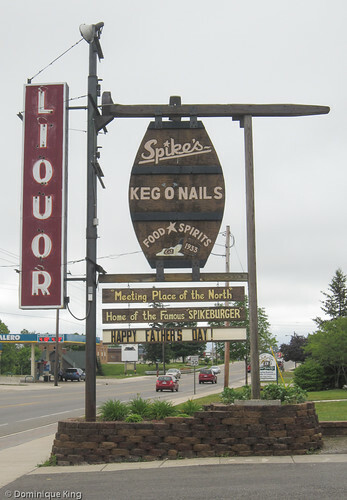 Harold "Spike" MacNeven held a contest to find a name for his new tavern, and a local woman, Laura (Welch) Smith won the $20 prize with her suggestion to name the place Spike's Keg o' Nails as a nod to the area's lumbering history and the tavern's newly legal kegs of booze. Spike was a big community booster, helping to organize a popular Canoe Carnival in 1932 that helped establish Grayling's reputation as a canoeing destination and establishing tobogganing runs to draw tourists into the area for winter sports. He also drew many professional sports figured like the popular 1920s-era boxer Jack Dempsey. Spike's has remained at the same location since 1933, although the building burned to the ground and Spike rebuilt it...twice. 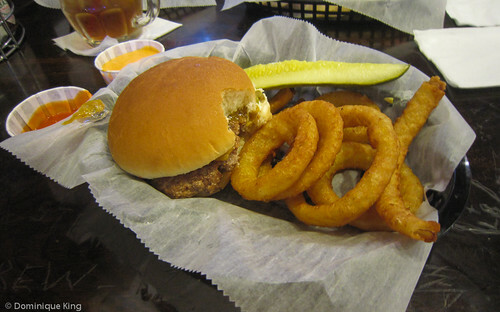 Today, Spike is gone, but his tavern lives on as a favorite "Up North" meeting place famous and loved for its burgers. Spike's turns out nearly 30,000 1/3-pound burgers each year, so we opted to order Spikeburgers. The Spikeburger is a good classic bar burger. You can order a classic Spikeburger with mustard, ketchup, pickles and onion, or you can customize it (I skipped the ketchup and onion, adding hot sauce to mine). The addition of a cold beer and a side of onion rings made for a classic and satisfying tavern meal. It was also fun to sit in the old wooden booths, deeply etched with names and dates of previous visitors. Archery bows and memorabilia line the walls at the Bear's Den in downtown Grayling as a tribute to Fred Bear, a long time bow hunter, bow manufacturer, author and television host who made his home in Grayling for many years. Fred Bear also had a popular museum in town and rates mention in one of "Motor City Madman" and avid hunter Ted Nugent's songs. 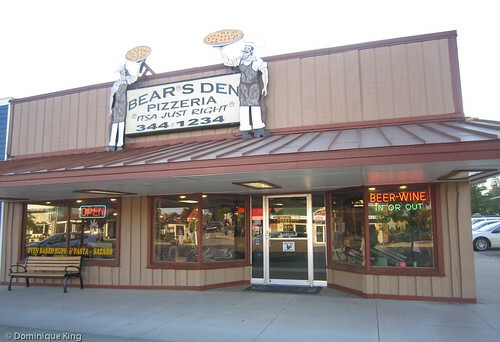 The Fred Bear Museum in Grayling from the late 1960s until the mid-1980s was the largest privately held collection of archery artifacts until the Bass Pro Shops acquired the collection after Bear's death in 1988. Bear helped promote Michigan's first bow-hunting season in 1936 and opened his archery company in Grayling in 1947. Bear moved the company to Gainesville, Florida as his health declined in the 1980s, but Bear Archery still exists and you can see a photo of the Grayling business from 1957 at the top of Bear Archery's Facebook page. The restaurant's menu features pizza, as well as pasta and sub sandwiches (or "hups"). 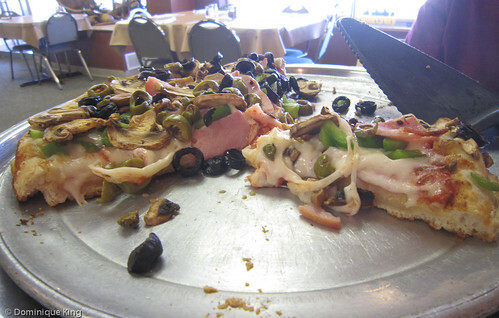 We opted for a pizza with our standard cheese, ham, green and black olives, and mushroom toppings. It did give us pause when our server asked whether we wanted fresh or canned mushrooms, but she told us many of their customers preferred canned mushrooms (although neither she or we could figure out why that would be the case). We ordered our pie with fresh mushrooms. The pizza was tasty and hot, the salad we ordered was fresh, and the beer was cold...a pretty perfect meal in my mind! 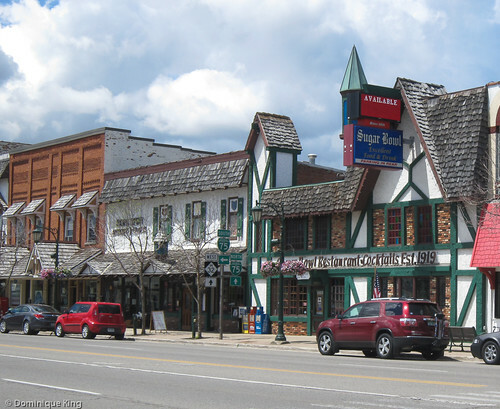 Established in downtown Gaylord in 1919, the Sugar Bowl is one of the state's oldest family owned restaurants. George Doumas purchased the place (with his brother Jerry) after returning from his military service and working as General Pershing's personal chef during World War I. The brothers opened the business as a sweet shop named for a soda shop in the then-nationally syndicated "Harold Teen" comic strip. There were a number of Sugar Bowls around the country, but many of them closed or changed names as homemade ice cream and candies became very expensive to make. The Doumas family added light lunches to the menu and began serving beer and wine after the repeal of Prohibition in 1933. George's son Bob, and his wife Betty, took over the business after George's death. I liked seeing the display of vintage photos of Gaylord and the Doumas family lining the halls as we entered the restaurant from the back parking lot. I'm afraid to say we didn't find it nearly as interesting. 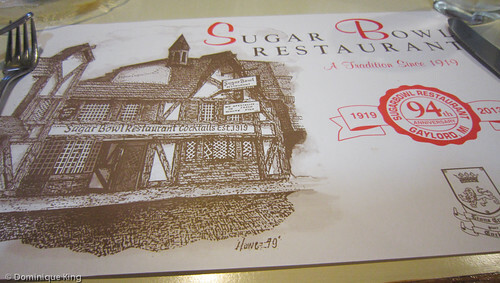 The Sugar Bowl seems to be a place people either love, or they don't, according to the reviews I saw on Yelp. Folks seem to remember the restaurant fondly from their childhoods, or they peg it as dated and uninspired. We ordered "comfort food" meals as we thought it would be the type of thing a place like this should do well. 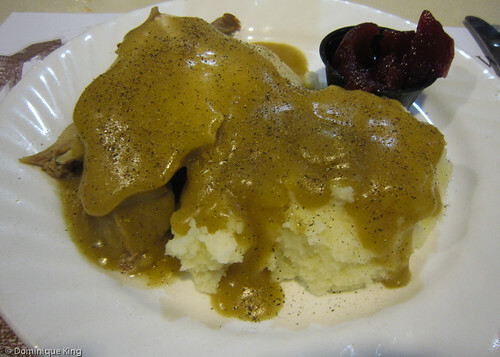 However, Tim said his turkey dinner was extremely dry, and I just couldn't get past the fact that my macaroni and cheese arrived with a slice of partially melted processed cheese food atop it. We ate in the family dining area during a weekday afternoon and, while a good crowd was there, it's doubtful there were many of us under 70 years old. The menu included comfort-food type meals, a few Greek specialties as a nod to the family's heritage and a few German specialties because of the town's theme as an Alpine-style village. I'm wondering if the restaurant would be better with a smaller and more focused menu, or if we would have better luck with breakfast or with dinner in the restaurant's Open Hearth Room which boasts more upscale entrees.